Outside my window... Hot and sunny 82 degrees! I am thinking... about what to give our family for Christmas. Since I haven't worked since August, it will have to be homemade and inexpensive. But nonetheless, it will be awesome! I am thankful for... a roof over our heads. From the kitchen... a Naan dough rising. I'm cooking vegetable naan "pizza" for dinner. I am wearing... DIY I ♥ NY t-shirt with black shorts. I am going... to check on the naan after this. I am reading... House Rules by Jodi Picoult. I am hoping... Nathaniel takes a nap soon. He is starting to get cranky! I am hearing... Nathaniel playing in his jumper. Around the house... clean, folded laundry that needs to be put up. A few plans for the rest of the week... Nathaniel turns 10 months old this Friday; Hubby has CFT(?) on Saturday; Weight check and second influenza booster shot for the little one on Monday. 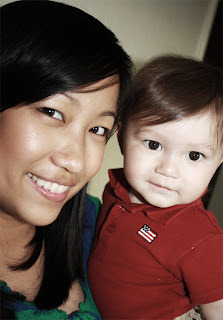 Here is a picture I am sharing... 10.05.10; Being the photographer of the family means I'm rarely ever in the pictures. So these definitely are few and far between.